The official lyric video for the song "Under Rapture" from SOULFLY can be seen below. The track, which features guest vocals from Ross Dolan (IMMOLATION), is taken from the band's new album, "Ritual", released earlier today (Friday, October 19) via Nuclear Blast. "It was really exciting for me to be part of new SOULFLY album," commented Dolan. "'Under Rapture' is a crushing song and I was on board the second I heard it. It was truly an honor for me to have been part of this. I think it's a sick song both musically and lyrically and I am really happy with the end result! "This collaboration started last February when we were invited out as support on the 'Return To Roots' tour which eventually led to Max singing on the 'Morbid Visions' cover we did for the 'Death Is Just The Beginning' comp. As fans, having Max part of this made it really special and truly meant the world to us." 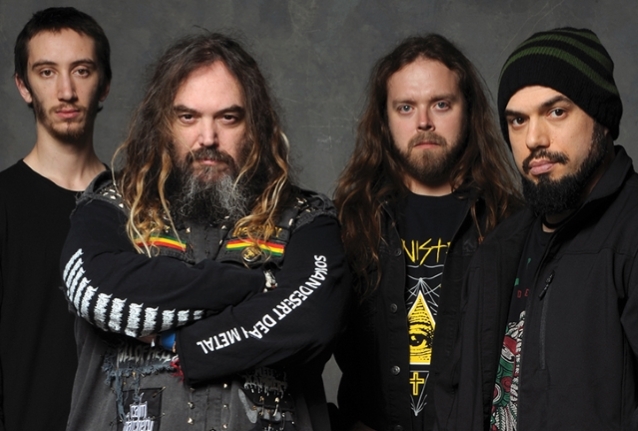 SOULFLY has announced its first tour in support of "Ritual". The trek, which will take place next January/February, will feature support from KATAKLYSM, INCITE, CHAOSEUM, ALUKAH and SKINFLINT. The follow-up to 2015's "Archangel", "Ritual" was produced, recorded and mixed by Josh Wilbur (KILLER BE KILLED, LAMB OF GOD, GOJIRA). Cover artwork was painted by artist Eliran Kantor (TESTAMENT, ICED EARTH, SODOM). Additional booklet art was handled by Marcelo Vasco (SLAYER, HATEBREED, KREATOR), who also handled the package design. The album features multiple guests, including Randy Blythe (LAMB OF GOD).